Real worship is about Jesus. It IS costly. And it DOESN’T make sense. Scientists tell us of the powerful ability of the sense of smell to trigger memories—that the olfactory bulb in our brain links scent to event. That is why walking into a home with cookies baking in the oven can carry you back to the security of grandma’s house decades earlier. Scent, somehow, unifies and cements all 5 senses and places us, momentarily, in the experiences of our past. One suspects the story of the anointing by the woman at Bethany provided just such a fragrant link in the disciples’ minds between burial perfume and Jesus’ looming Passion. The story of the woman of Bethany was obviously an important one in the early church, as all four Gospel writers record it (Matthew 26:6-12, Mark 14: 3-9, Luke 7:36-49, John 12:1-8). As a whole, the Gospel writers tell us three things in this story: Real worship is about Jesus. It IS costly. And it DOESN’T make sense. That is why it is so odd that in this fragrant Gospel narrative, the memory of the eyewitnesses seems fuzzy… There is a woman. There is an anointing. There is expensive, perfumed oil. There is the objection to using it on Jesus. But then the details start getting jumbled. Are these four accounts one event? Two? Three? Scholars have wondered for centuries. It’s easy to get frustrated with the Gospel writers here. They carefully name and give character to the Twelve, yet they blur the details of this woman and her story. Who was this woman? Both Matthew and Mark have Jesus predict that this story will always be told in memory of her…but then her name conspicuously escapes them. Luke tells us she was a “a sinner.” John alone tells us that her name was “Mary.” But Mary was the most common women’s name in first Century Palestine. There were three women named Mary present at the crucifixion that we know of. Which Mary is this? Luke places the story early in his Gospel. Matthew, Mark, and John place it in Bethany, the day before the Last Supper and Jesus’ arrest by the mob in the garden. Here are a few more details: Several days before his betrayal and death, Jesus and his disciples dine at the home of Simon the Leper in Bethany. While they recline at the table, a woman, whom John, the last Gospel writer by decades, identifies as Mary of Bethany approaches Jesus. We don’t know how long she had followed Jesus. What we do know is that Mary knew that worship has an object: Real worship is about Jesus. Mary has an alabaster jar of expensive perfume, worth a year’s wages. These jars, we are told, were permanently sealed. To let the perfumed oil out one had to break the neck off. Once opened, like a jar of mayonnaise, it had to be used. Mary broke her jar, and emptied the perfume on Jesus. Real worship is costly. In another fuzzy detail, John has the woman anoint Jesus’ feet, wiping them with her hair. Matthew and Mark report that the woman of Bethany anointed Jesus’ head. Both actions flower with symbolism. In the ancient Near East, anointing the head signified Kingship – Kings were anointed at their coronation by the high priest or prophet. The word “Christ,” is a transliteration of the Greek word “Christos,” itself a translation of the Hebrew word for Messiah, which means “the anointed one.” As Rachel Held Evans says, “This anonymous woman finds herself in the very untraditional position of priest and prophet.” Only in the upside-down Kingdom of Jesus, does this make sense.” Because real worship DOESN’T make sense. Anointing feet, on the other hand, models humility, service…love. John’s account is more intimate. Awkward even. In a culture in which a woman’s touch was forbidden, for Mary to cradle Jesus’ feet in her hands and brush oil over his ankles and toes with the ends of her hair was unthinkable. This is most likely the oil for her own burial she has poured out. Mary breaks her treasured bottle of burial perfume and empties it on Jesus. She spares no expense. She is fully committed. She is “all in” – sacrificing her own future. The self-emptying of this action foreshadows Jesus’ washing the disciples feet to come the next day on Maundy Thursday. And just as we see the male disciples discomfort at that event, the disciple’s unease at her display of affection is palatable. Real worship is about Jesus. It IS costly. And it DOESN’T make sense. In the midst of all this symbolism and foreshadowing, Jesus interprets this event for us: It is an act of worship in preparation for his burial. When the disciples rebuke the woman for what they see as a waste of money, Jesus returns the rebuke saying, “Why do you trouble her? She has performed a good service for me. You always have the poor with you, and you can show kindness to them whenever you wish; but you will not always have me. She has done what she could; she has anointed my body beforehand for its burial.” Jesus had been speaking of his impending death for a good while, but the Twelve kept missing it. The idea of a kingdom ushered in with the death of their friend rather than the death of their enemies was unthinkable. It is no wonder they complained about the “waste” of money the anointing represented – they assumed they would need to finance their ministry with Jesus for years to come. Mary alone seems to get it. She is the first of Jesus’ disciples to acknowledge his impending death… the one who anoints “the anointed one.” For this, Jesus gives her his highest praise. “Truly I tell you, wherever the good news is proclaimed in the whole world, what she has done will be told in remembrance of her.” What a remarkable thought—that from open air revival to cathedral, Europe to Uruguay, Israel to Africa, this woman’s story would be told. Jesus wanted us to remember. Yet we aren’t even sure of the woman’s name. How is it that, unlike other Gospel stories in which details drop out as we get to the later Gospels, her name does not appear until very late? I suspect it is because this good lady did not want it to appear. The beneficiaries of Jesus’ ministry joined the early church after his resurrection. They shared their stories to encourage one another. Later, when it became obvious that Jesus was tarrying in his expected return, writers gathered and recorded those stories. In the early stories of blind Bartimaeus, for example, we know Bart’s name, his dad’s name, and even that a blind friend was beside him in the early Gospels. But by the time (and distance) that Luke writes, Bartimaeus is presumably gone and his name is dropped. Bart’s story had been told so often that it does not even make John’s Gospel, the last one written. So why is this woman not named by the early authors? The obvious guess is that it was specifically because she was still around. And SHE did not want it named. We know that Mary was a worshipper. My guess, knowing a few Mary types, is that, for Mary, worship was, first and foremost not about her, but about Jesus. And she didn’t want folks to get distracted in admiring her. My guess is that Mary is named by John specifically because she is no longer around to keep a witness from recording her name. But what of you? Where is your focus? What is your perfume? What do you guard and value above all else? Is it material possessions? Is your perfume your reputation? Friends? Career? Take a moment and name that which you value most, because you cannot pour out that which you cannot name. The challenge of Mary this Holy Week is that we would dare break open that which we value most and pour it out as a fragrant offering upon our Lord. Perhaps, with the help of the Holy Spirit, the scent might trigger a memory… like the comfort of grandma’s house, bought through decades of difficult labor during hard times, we would be reminded that our comfort from God was bought at a high price. Because Real worship is about Jesus. It DOESN’T make sense. And it IS costly. *This was the message from “Dinner Church,” our Wednesday Holy Week liturgy for families. The service is based on one done at St. Lydia’s in Brooklyn. It has a contemplative feeling (with Taize-esque music.) It is based on 1 Corinthians and what is thought to be the earliest non-canonical Christian literature, a teaching tool called The Didache. It is essentially the biblical “love feast” (Jude 1:12, 1 Cor. 11). The candle lit room set in a circle and contemplative music work well for our rowdy urban kids. The people prepare the meal together, light the worship/dinner space, pray and sing, and eat over candle light. It also gives us a chance to give folks an overview of the upcoming Triduum of holy week and pass out devotionals for families to use at home. They didn’t know what they were doing when they made John Archbishop of Constantinople. They learned not to give a captivating speaker a microphone if you don’t know what he is going to say. 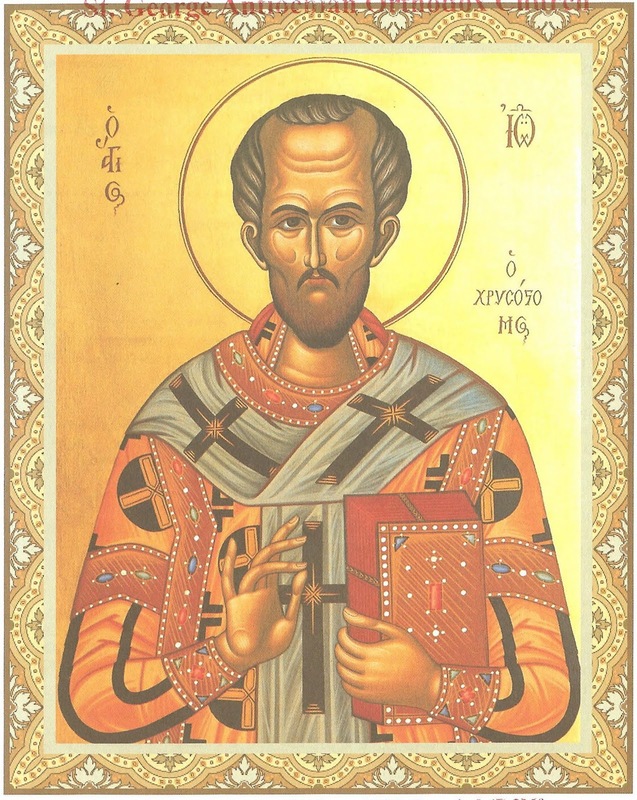 John Chrysostom or “golden-mouthed” had a promising career in Greek rhetoric that he dashed by becoming a Christian, then a hermit to memorize the Bible. When his health forced him back to civilization, he became a preacher of great fame. He taught the scriptures practical everyday application, including preaching against the hoarding of wealth (angering some of the wealthy), and that priests should serve where assigned rather than touring for honorariums (angering the priests). He was the first (that I am aware of anyway) since the biblical authors to treat intimate marital relations as a good thing. Here is a sermon excerpt from the late 300’s. Homeboy could preach! A virgin, a tree and a death were the symbols of our defeat. The virgin was Eve: She had not yet known man; the tree was the tree of the knowledge of good and evil; the death was Adam’s penalty. But behold again a Virgin and a tree and a death, those symbols of defeat, become the symbols of his victory. For in place of Eve there is Mary; in place of the tree of the knowledge of good and evil, the tree of the Cross; in place of the death of Adam, the death of Christ. gives life again to those who were born before it. Who can tell the Lord’s mighty deeds? By death we were made immortal: these are the glorious deeds of the Cross. The Cross did all these wonderful things for us: the Cross is a war memorial erected against the demons, a sword against sin, the sword with which Christ slew the serpent. The Cross is the Father’s will, the glory of the Only-begotten, the Spirit’s exultation, the beauty of the angels, the guardian of the Church. Paul glories in the Cross; it is the rampart of the saints, it is the light of the whole world. Bishops vs. Bibles: Authority in the early church. Yes, kiddos, there really is a Santa Claus.